Daffodils – don’t you just love them! There we were in the dark depths of winter and suddenly up pops spring! 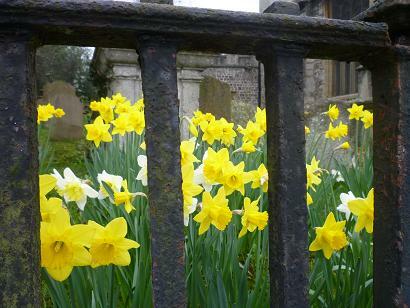 Treat daffodils kindly, dead-head them when they finish flowering and most importantly, do not tied them up in knots. If they are in the wrong place, dig them up in a hefty clump and place them where they will look their best. Now at last, we can think about sowing some vegetable seeds: carrots, peas, broad beans, spinach, radish, parsnips and leeks can all be sown now. Tomatoes take up a lot of room on your windowsills so unless you are planning to grow an unusual variety, it is better to buy small plants when the likelihood of frosts has gone. The same goes for the bright and gaudy trays of annuals that are on display at the garden centres. They will be an expensive loss if planted out before May, however tempting they may seem. Another task th is month is to cut your ornamental grasses right down to the ground. Leave evergreen varieties alone but the Miscanthus family must be cut as soon as possible. 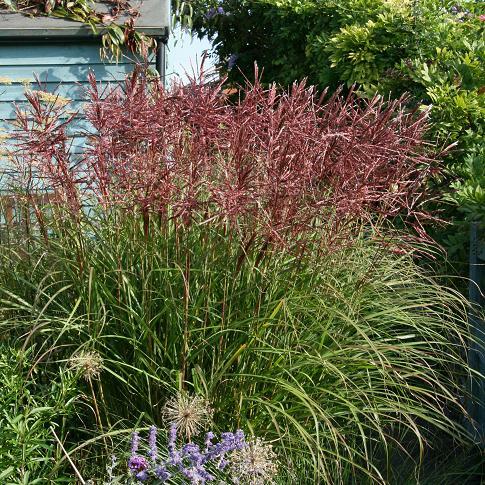 Miscanthus ‘Flamingo’ is one of my favourites and like most grasses, it brings a herbaceous border alive with its dark pink inflorescenses billowing in the wind. Tadpoles are also a delight of early spring and if you only have a small garden, then why not go for a mini pond? Sunken or above ground, any deep watertight container will do but remember to put a ramp in sunken ponds for visiting hedgehogs. Planted up with Marsh Marigolds and an evergreen reed such as the Corkscrew Rush Juncus effusus spiralis, the pond will be attractive for several months and will not need watering when you go on holiday. The sun is shining now so I am off to the garden!